My printer says they want our logo in vector format. What does that mean and why can’t they use my high-resolution JPG, TIFF, etc.? To put it very simply, with vector graphics, we can enlarge or reduce your file by any percentage and not have a loss of graphic quality because the graphic is made up vectors (mathematically defined elements like lines and points). Vector graphics are commonly created in Adobe Illustrator, and will have file extensions like EPS or AI. However, just because Adobe Photoshop lets you save a PSD as an EPS, does not make it a true EPS! The file had to have been created in something like Adobe Illustrator or Quark Express to truly make it vector. Almost all other image file types such as JPG, TIFF, GIF and BMP are raster images (made up of pixels), and do not work well for print. For instance, if you were to provide a high-resolution raster image for your business cards, letterhead, and envelopes, you would need to send us three different logos, at a minimum of 600 dpi (dots per inch, or resolution), at the size they would be printed at. It is much easier to just send one vector file and let us do the rest! If you are unsure whether or not your file would work for print, it is easy to send it to us via file upload on our website, email or drop the file by on a USB thumb drive. We can let you know whether it will work for you application, and if not, what your options are. Our graphics team is able to re-create most all artwork into vector format for a nice printed product. Make sure that once you have your company’s logo in the correct formats to keep a copy in more than one place (for instance, on a burned disc as well as a computer hard drive). 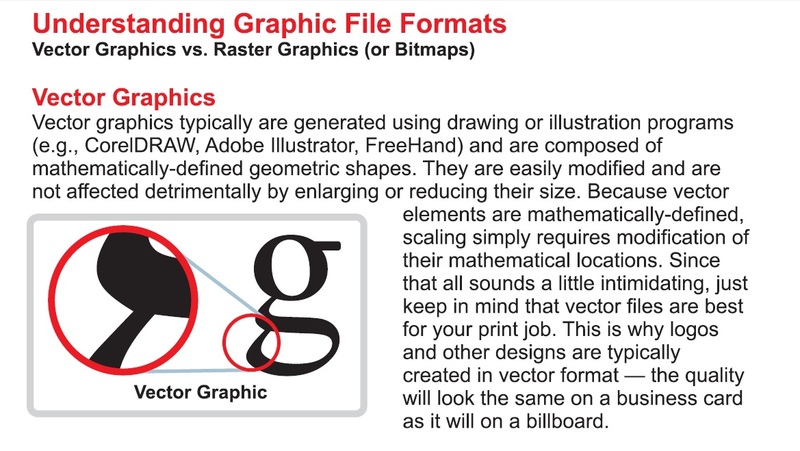 After looking at the graphics for more in-depth information about raster and vector graphics, do you still have questions? We are always happy to discuss file types, branding, images, logos, marketing and any other printing-related topics with you – call us at (253) 852-6020 today. This entry was posted in Design, Print FAQ, Printing, Uncategorized and tagged artwork, bitmap, eps, FAQ, gif, graphics, jpg, logo, png, print, printer, Printing, psd, raster, vector. Bookmark the permalink.